Lewis Froud and James Willis, both from 1st King Alfred’s Scout Group, received their Certificates and badges from Liz Keevil, Stuart Rae’s sister, at a recent Awards Evening last month, after completing the Stuart Rae Challenge. T he Stuart Rae Challenge is the ‘jewel in the crown’ of the King Alfred District Scout Diary. It was initiated 45 years’ ago to celebrate the life of Captain Stuart Rae (1947 – 1971), who had been a scout with the district who then went on to become a member of the Royal Marines. Captain Stuart Rae was a passionate adventurer, with the boundless drive and enthusiasm to take on a challenge. Sadly, he was killed in action in the Arabian Desert at the age of 24. Since then, the Stuart Rae Challenge has taken place each year to commemorate his life and achievements. 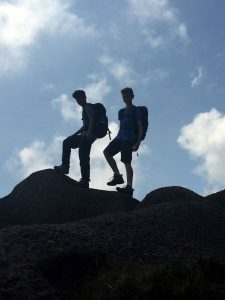 As part of a whole year of dedication and commitment, between February and October 2016 Lewis and James completed a tough programme of training involving First Aid, navigation skills, hiking (11 days in total), and camping to become competent backpackers, navigators and hillwalkers. Having completed various hikes during the year over difficult terrain in areas such as Snowdonia and the Black Mountains, the challenge culminated in a hill walking weekend hike in severe wet weather in the Brecon Beacons in October this year where they walked as a team of four, unaided, for around 25 miles over two days camping overnight along a route planned and navigated by themselves. 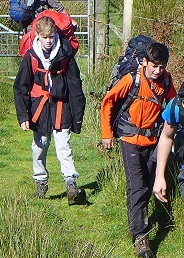 Getting through the tough challenge in the remote and rugged environment meant they had to work hard as a team. The final part of the challenge was for the boys to present an account of their experiences to an assembled audience including family, scout leaders and officials and local dignitaries, including Steve Trinder, Wantage Mayor and June Stock, Chair of Grove PC. Everyone at King Alfred’s would like to offer our heartiest congratulations to Lewis and James on their wonderful achievement!